For as long as cruise ships have been sailing, cruise lines have been dreaming up imaginative ways to keep cruisers on their toes. This race has only heated up in the past decade, with lines no longer content to deliver Broadway-caliber entertainment. We’ve rounded five of the newest venues for awesome technology-oriented entertainment on cruise ships that you shouldn’t miss out on. 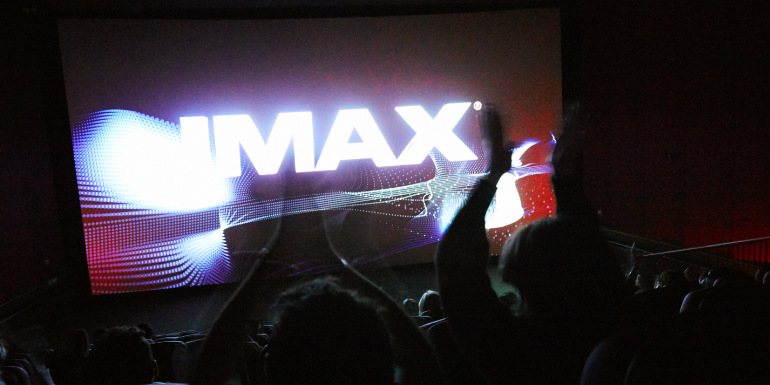 The Venue: Carnival Cruise Line broke cruise industry ground when they introduced the first IMAX theater at sea aboard Carnival Vista. The larger, crisp 3D visuals and precise surround-sound make you feel as though you’re really living the movie you’re seeing, and there’s plenty of films to choose from aboard the ship. The upcoming Carnival Horizon will also include an IMAX theater, as it’s already been a very popular entertainment choice for Vista guests. What to Watch: The theater plays first-run movies, recent hit films, and IMAX documentaries. 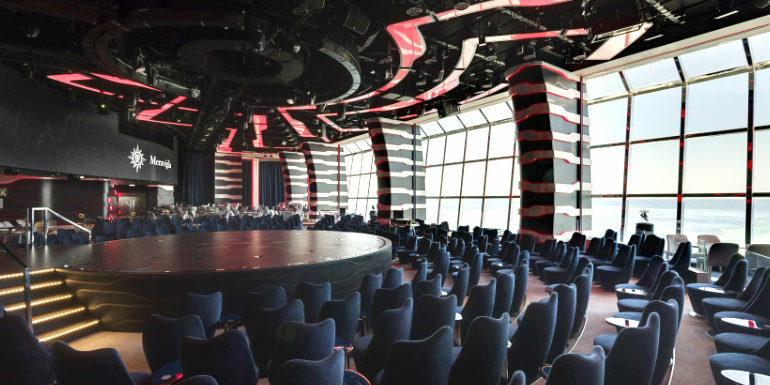 The Venue: This aft-facing panoramic theater is exclusively found on Royal Caribbean’s Quantum-class ships, and it’s the place to be if you want sweeping views of the ocean. Not only that, but the expansive windows transform into just about any scene for various entertainment shows throughout your voyage, such as cityscapes, expansive rooms, and abstract designs. 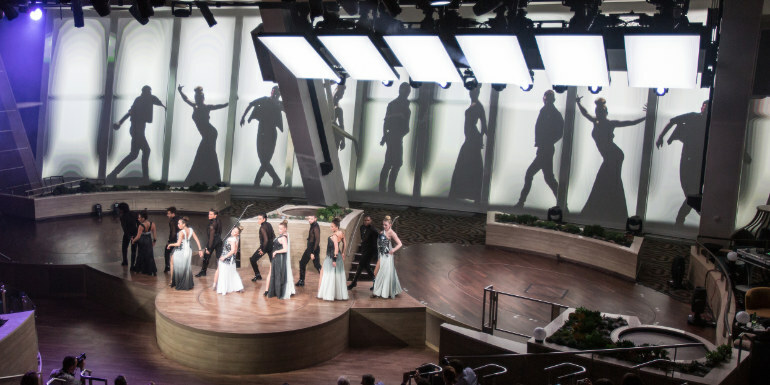 There are also six agile “Roboscreens,” which tell a story through movement, music, and carefully-choreographed video. At night the space morphs into a nightclub with a large dance floor, and there’s also food and drinks available throughout the day. What to Watch: The song-and-dance show Spectra’s Cabaret, virtual symphony performances, and even daytime seminars. The Venue: This whopping $22 million theater aboard the new MSC Meraviglia was custom-designed for aerial shows created in partnership with Cirque du Soleil. You can also opt to experience a full dinner in the space before the show that coincides with the theme, or a specially-crafted cocktail along with other tempting treats. What to Watch: Immersive projections, sounds, and colors will take guests on a journey as they take in each acrobatic performance. While the entertainment company has performed on cruises before, the two unique shows onboard will be the first original Cirque du Soleil productions at sea. Each Meraviglia-class vessel will offer a Carousel Lounge with original shows. The Venue: The two newest ships from Princess have a unique feature that set them apart from other cruise ships: a television studio that has its very own channel on stateroom TVs. The Princess Live! space design was inspired by a real television studio, and can accommodate a wide range of entertainment productions so guests will always find something they love. 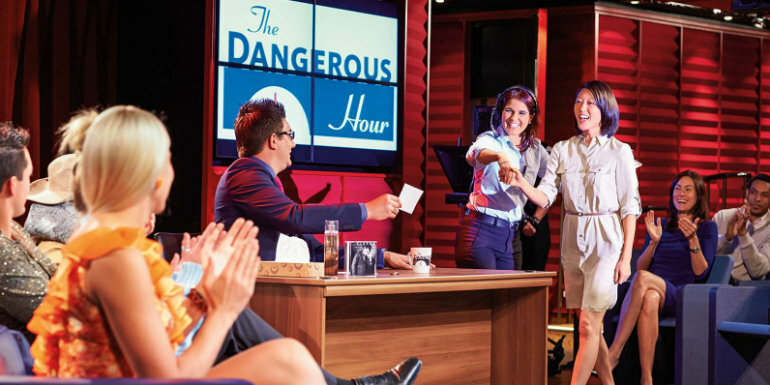 What to Watch: Cruisers have the chance to be a part of the studio audience for interactive cooking shows, live concerts, game shows, and late-night comedy. There’s even a murder mystery show where the audience is given the task of figuring out whodunnit, how they did it, and why. Think of it as a life-sized game of Clue (without an actual murder). 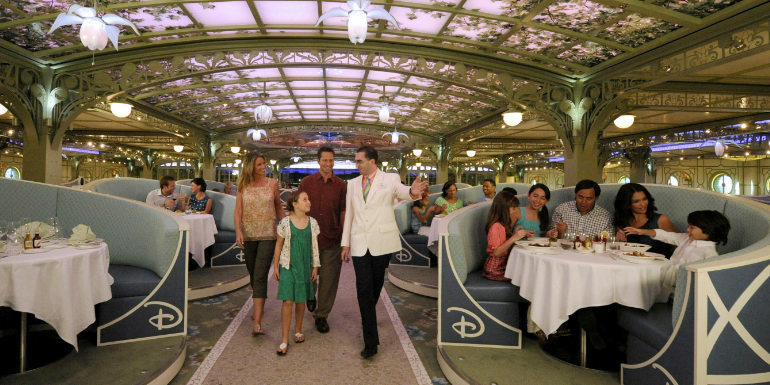 The Enchanted Garden restaurant on Disney Dream and Disney Fantasy - The Enchanted Garden is one of the main rotational dining rooms on Disney Cruise Line, meaning all guests will have a chance to dine in the colorful, bright space. During the course of your meal, the restaurant’s ceiling changes from a bright daytime blue to the golden red of sunset, finally transforming into a vista of twinkling stars. Flower lights also “bloom” around the space, wall paintings illuminate, and the center fountain is flooded with light. MSC Meraviglia’s LED dome - This massive LED screen at the top of Meraviglia’s indoor promenade is a sight to behold. No matter the time of day, there will be a scene transforming on the massive “sky.” It will feature sunrises, sunsets, events, beautiful scenes, fireworks, and even a starry night. Carnival Vista Atrium - As far as vistas go (get it? ), Carnival Vista has a pretty neat atrium centerpiece. The massive funnel-shaped LED screen reaches from floor to ceiling and projects a huge variety of visuals, dubbed “dreamscapes” including fish in the ocean, a galaxy, the beach, and a chandelier. On occasion, it even morphs into a martini glass. Which of these entertainment choices are you most excited to experience?